Thailand has long been a popular holiday spot for Australian families – it’s not too long a flight, it’s relatively safe, good value for money, not to mention that the culture, natural environment and shopping opportunities are amazing. Phuket and Koh Samui are firm favourites but away from the hustle and bustle of these Thai tourism spots, back from the beaches and higher into the mountains, is something quite special. The natural beauty of Chiang Mai is breathtaking – here you may find you’re seeing more of the “real” Thailand, with green paddy fields, Buddhist monks and all the vibrancy and crafts the locals have to offer. It’s a slower pace with plenty of time to take in the magnificent scenery and rejuvenate your mind, body and spirit. Perhaps you’d like to meditate or further explore Buddhism, practised by ninety per cent of Thais? 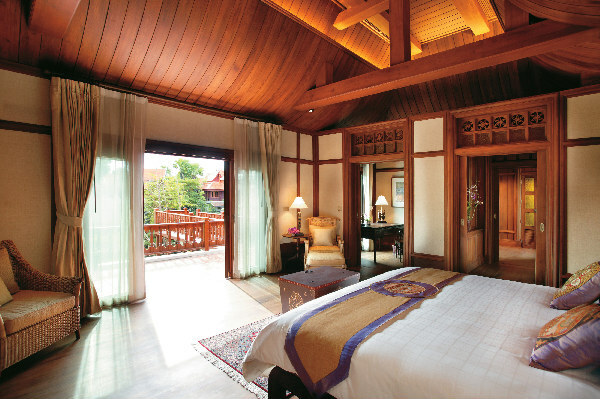 For accommodation that will leave you gob-smacked with its beauty, try the Mandarin Oriental Dhara Dhevi. 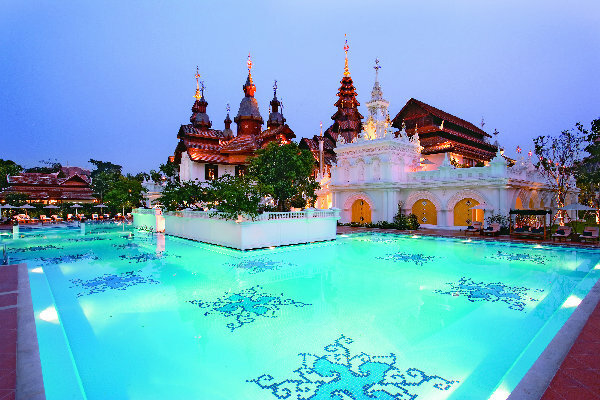 It’s the only luxury hotel and resort in Chiang Mai, and the amazing artwork and Lanna architecture has to be seen to be believed. 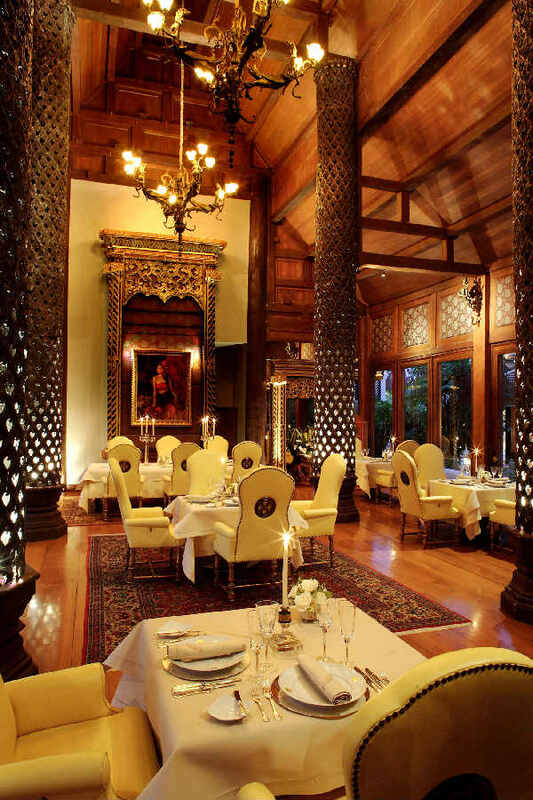 The accommodation is described as a “visual journey through the history of the Lanna region” with a mixture of northern Thailand, Myanmar, China, Laos and colonial influences. 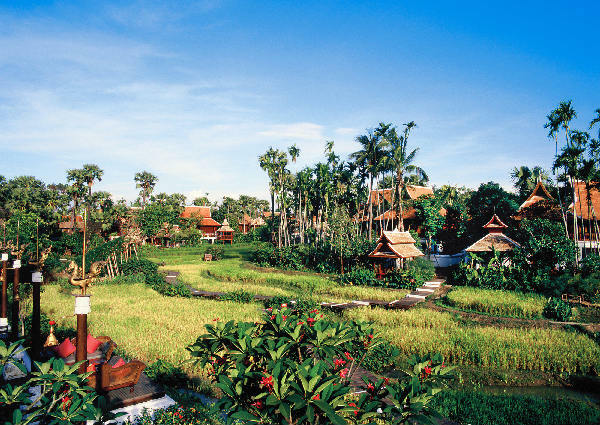 And it’s all set on more than sixty acres of pristine paddy fields and plantations. Soak up the culture while being pampered like royalty – it’s basically its own self-contained city. Each night you can stroll through this walled paradise and take your pick from the renowned Le Grand Lanna, famous for its Thai food, Farang Ses, one of the most acclaimed French restaurants in Thailand, regional Chinese restaurant Fujian, famous for its dim sum lunch, or a number of other places to eat or drink. 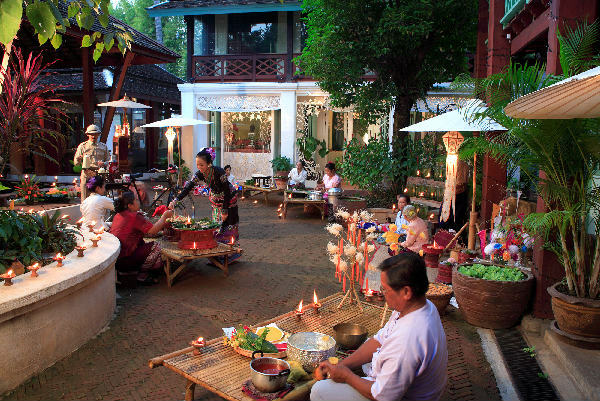 You also have the option of private dining – from a barbecue at your villa to a candlelit dinner in the paddy fields. Why not come away with a few new culinary skills yourself? 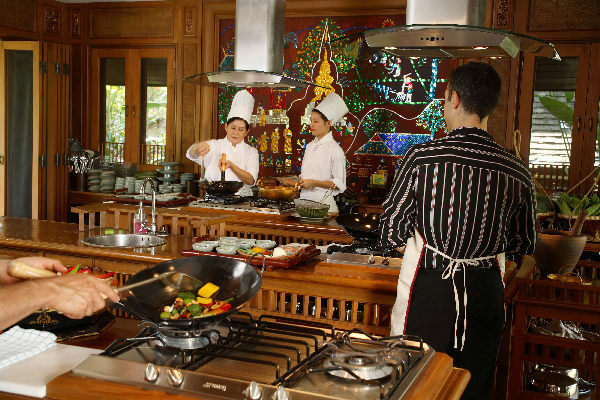 The Culinary Academy will create a holiday with a difference – in the classroom-style kitchen you’ll become familiar with the Lanna herbs and spices and learn to cook authentic Thai dishes. With all this cooking and eating, you may want to move those muscles. Yes, there are the usual resort facilities – two swimming pools, two tennis courts and plenty of room to jog, walk or hike, but why not centre yourself in the calm way of life here and take in one of the many yoga classes on offer? Or have your muscles tended to in a different fashion: if you’re feeling achy from the flight over, or just from harried life in general, you’re going to L-O-V-E love the spa. It’s named The Dheva Spa after the Star Goddess, guardian of longevity and spiritual enlightenment. The holistic treatments take in residential Wellness Programmes and the Ayurvedic Centre. Balance your doshas or indulge in the spa’s heat and aqua oasis. The design was inspired by an ancient Mandalay Palace and it’s so beautiful you could feel refreshed instantly by just soaking in the ambience. Make sure to check out the roof – it has seven tiers to acknowledge the seven steps to nirvana and the attainment of spiritual and physical perfection. Even the shopping is an experience in itself: forget the mall outing here, it’s a cultural day out. Interact with the locals and barter at the factories, markets and the famous night bazaar. With all this in mind, you’d be right to think that your children would be treated to something special too. There’s no stock-standard kids club here: the Lanna Kids Club goes one step further and teaches your young ones about life in Thailand. 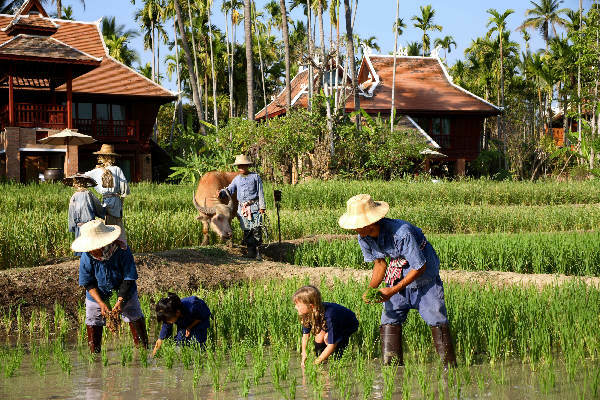 There are fun things to do that will definitely qualify for “show and tell” when they get back to school: they’ll learn to write their names in Thai, perfect the art of lotus folding and Thai dance, visit the paddy fields, ride a water buffalo and learn children’s yoga. The five-day programs also incorporate amazing experiences where your kids can be a zookeeper for a day and mind their own elephant, or be introduced to Thai boxing, take part in a children’s Thai cooking class or go on a night safari where they can see the native wild animals in their own habitat. They’ll also be treated to a personalised welcome cookie on arrival, while parents of young children will be treated to complimentary baby toiletries and use of baby equipment, such as nappies, bottles and bottle warmers. And baby cots and rollaway beds are also available at no extra charge. Babysitting services are also available by arrangement. In Thailand, children are much adored – and yours will be treated like royalty, just as you will be.